Revolutionary War veteran William Mason purchased 640 acres of land in what is now downtown Mason in 1803. He named the village Palmira, but the officially recorded name of the village is "Palmyra." In 1835, the town petitioned to have the name corrected, only to find out that it had been listed as "Kirkwood," possibly because the postmaster at the time was William Kirkwood. When the village officials were informed that there was another Palmyra in Ohio, they changed the name to Mason. The town continued to be a small farming community, and was incorporated to be a city in 1971 with fewer than 5,700 residents. Population growth exploded here in the early 90s, and has continued to today, with over 25,000 residents now calling Mason their home. Major employers moved to the area during this time, which fueled much of the area's growth. Some of these are Cintas Corporation, Mitsubishi, Procter & Gamble's Health Care Research Center, and Luxottica Retail. Following the closing of Cincinnati's previous amusement park, Coney Island, Kings Island Amusement Park opened in Mason in 1972. Taft Broadcasting Company, Kings Island's original owner, moved many of the old Coney rides to the new park. The park was named Kings Island after the King Powder Company, which founded the neighboring town of Kings Mills for its workers in 1877. The park has had a series of owners throughout the years, and currently spans 775 acres. The Beach Waterpark opened in 1985. Other notable recreation destinations that established themselves at this time include Great Wolf Lodge and Conference Center and The Golf Center at Kings Island. 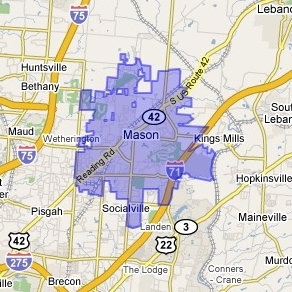 The prestigious Tennis Masters Series-Cincinnati is annually played in Mason. The King House and Carriage House of Ahimaaz King, the manager of King Powder Company, was built in 1885 and is listed on the National Register of Historic Places. The Kirkwood Inn and Historic Kirkwood Farmhouse, centuries old, have been restored and now operate as a premier bed and breakfast and events location.